With increasing percentages of web-based and hosted applications and a decrease in locally run applications along with 60% of workers already using a personal device once a day in their work, IT management has to accept and embrace Bring Your Own or Choose Your Own Device rather than trying to control or prevent it. 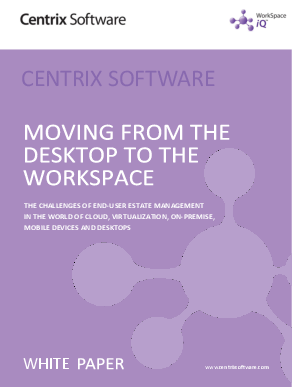 Centrix Software’s WorkSpace iQ reports on the complete usage across a desktop estate, matching users to apps to devices. This enables organizations to understand usage patterns in support of today’s operations and also take a more strategic approach to future workspace management transformations. Download this white paper to discover more.